We spent the weekend hibernating and working on a couple of house projects, so when Sunday night dinner came around, I was looking for something warm and cozy for a cold winter’s night. The food equivalent of a big fluffy blanket. The first thing that came to mind was a hearty Chicken Pot Pie, using a new Corningware circular baking dish from my Great Aunt Marian for Christmas. She knows me so well! 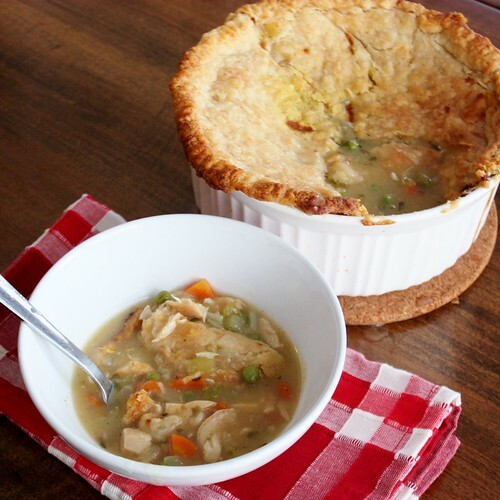 I love cold weather dishes like this – a thick hearty stew, with a crispy pie crust on top. 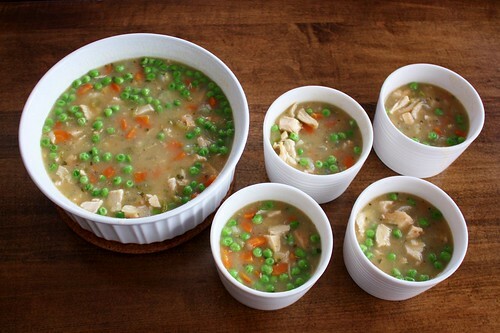 One bowl of this and you’re warmed right up. Although a second helping doesn’t hurt either. I used chicken I cooked and froze last month, making this recipe come together quickly. 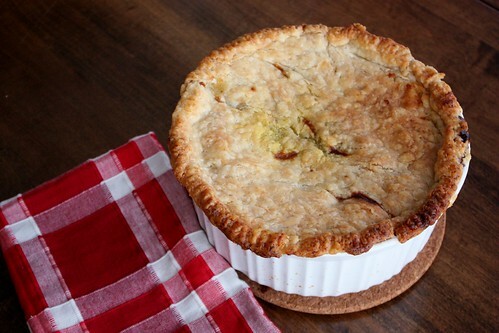 You can make this into one larger dish, or smaller individual pies as well. Mix flour, salt and sugar in a bowl. 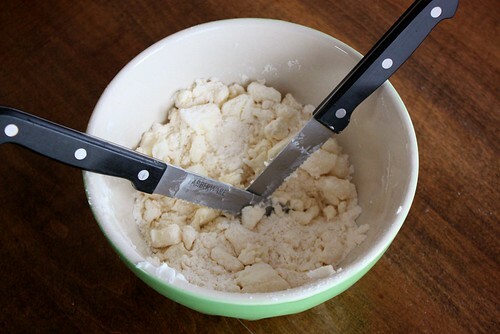 Cut shortening into dry mixture using two knives, until a coarse crumble forms. Slowly mix in water until dough starts to come together. 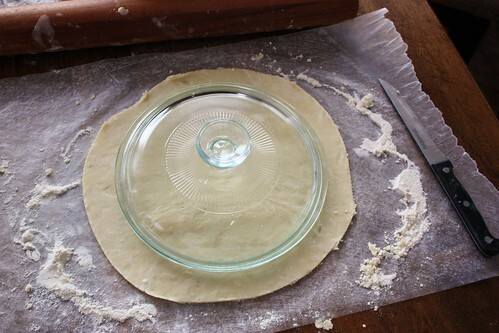 Form dough into a disc, cover in cling warp and refrigerate for an hour, while you make the filling. Melt butter in a large pot over medium-high heat. 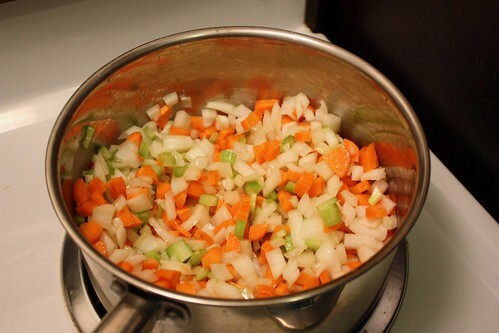 Add onion, carrot and celery to pot and cook until softened, about 8 minutes. Add garlic and cook for a minute. Add flour and stir to coat all the vegetables. Slowly whisk in the chicken broth. Bring to a boil, reduce heat and simmer until thickened, about 6-7 minutes. 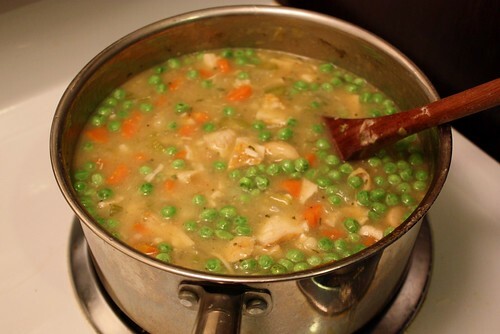 Stir in peas, chicken and spices. Season with salt and pepper. Pour filling into a 2 quart dish. 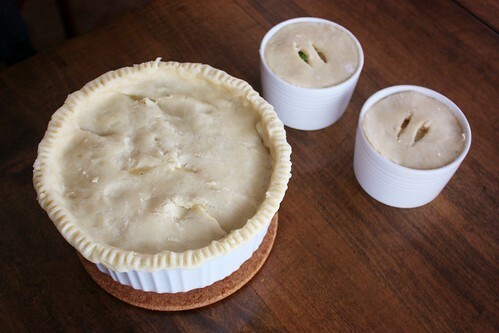 I used a 1-1/4 quart dish, and then poured the remainder into 4 small ramekins to make individual pot pies. Take the pie dough out of the fridge and unwrap. Dampen work surface and lay wax paper on top. The moisture will help it stick too your work surface, and the wax paper will make clean up easier. 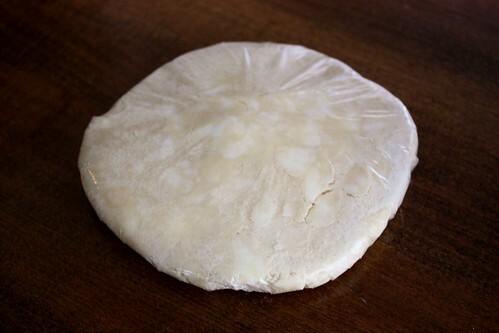 Flour the wax paper and roll out the dough to 1/8″ thick. To measure the size needed, I used the dish lid as a template to make a circle that was bigger than the dish, at least an extra 1-2 inches all around. Lay the dough over the casserole dish, fold over the excess at the edges and crimped the edges with a fork. Cut slits into the top to allow steam to escape. The dough scraps were enough to make little crusts for the individual pot pies. Place dishes on a rimmed baking sheet, to prevent spills in the oven. Bake at 375°F until crust is golden brown and filling is bubbling around the edges, about 40-50 minutes. Let cool for 15 minutes before serving. That looks so good! Your making me hungry. Yum! Perfect dish for this time of year.